If you spend even a small amount of time on the internet then, chances are that you’ve come across the term ‘cash back’ in relation to buying products online. For the savvy buyer, there are a number of websites which offer cash back on purchases – many up to 100% of the purchase price. Most of these websites are easy to use and free to join and, we’ve put together nine of our favourites to help you get more for your hard earned cash. Exactly as the name suggests, Cashbackbase is a website dedicated to offering cash back deals to its customers. Exclusive to products bought on Amazon, Cashbackbase offers a wide range of products including electronics, fashion and beauty and children’s toys and accessories. After a free and straightforward registration process, members can browse the list of products available and the deal which is being offered – many products on Cashbackbase are offered at a 100% discount whilst others offer discounts by increment, for example, 50% or 87%. Members click on the deal which interests them and can then view purchase instructions and the number of Cashbackbase points required. 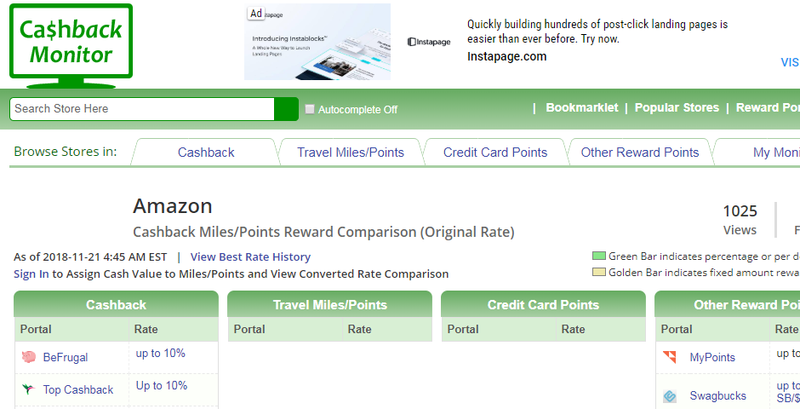 Cashbackbase points can be earned by inviting friends and family to use the site. With many items you will, unfortunately, be unable to take advantage of a deal until you have points in your account. If you have enough points, you can click on Check It Out which will direct you to purchase the item on the Amazon site. Once you’ve purchased your product on Amazon, you’ll need to access your Cashbackbase account again. Click onto ‘My Deal Request’ and then navigate to ‘Refund Request’. You will then be given instructions on submitting your Amazon order to Cashbackbase. Your order will be verified by the system and a refund of your purchase price will be credited to your account. 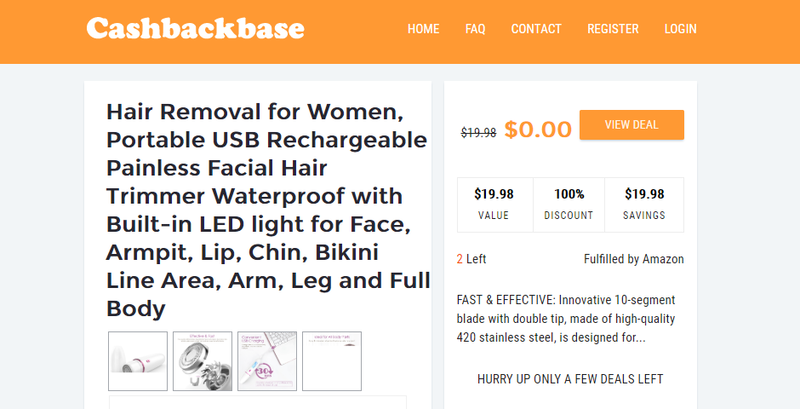 Easy to use and 100% transparent, Cashbackbase is a great way of getting hold of fantastic products at a discount or free as long as you have the cash to make the initial purchase. Topcashback is the go-to site for those who spend lots of time shopping online and enjoy saving money. You need to be a member to shop through Topcashback and it’s quick and easy to sign up. Products on offer include tech, vitamins, clothing, vacations and much more. Discounts range from 5% to 100% and, Topcashback also features exclusive member coupon codes which work alongside featured deals, sometimes doubling the savings to be had. In order to take advantage of Topcashback’s discounts, you need to sign into your account before then navigating through to your chosen store or outlet. This will ensure that your discount is automatically recorded. Once you’ve made your purchase, your discount will be displayed in your Topcashback account and can be cashed out at any time. Members can choose their method of cashing out including Paypal, Amazon gift cards and American Express Reward Cards. Refreshingly straightforward, Topcashback is a must for the serious online shopper. BeFrugal is more than good advice, it’s a great way of getting up to 10% off all of your Amazon purchases. Available on a huge range of products throughout Amazon’s site, BeFrugal’s handy Chrome extension allows members to automatically apply discounts (ranging from 2% to 10%) to their purchases. Once you’re signed up, you can browse by category or search for a particular product. BeFrugal even credits your account with $10 just for signing up! Choose your category on the BeFrugal site and click onto it to be directed to that category on Amazon or your chosen store. You can then browse as you would normally. Choose between receiving a voucher code or use your Chrome extension to receive your discount. Cashbackmonitor is a cash back comparison site and a great source for coupons and discounts. A handy member portal keeps track of your points and the at-a-glance comparison gives you a run-down of the available discounts on each site. 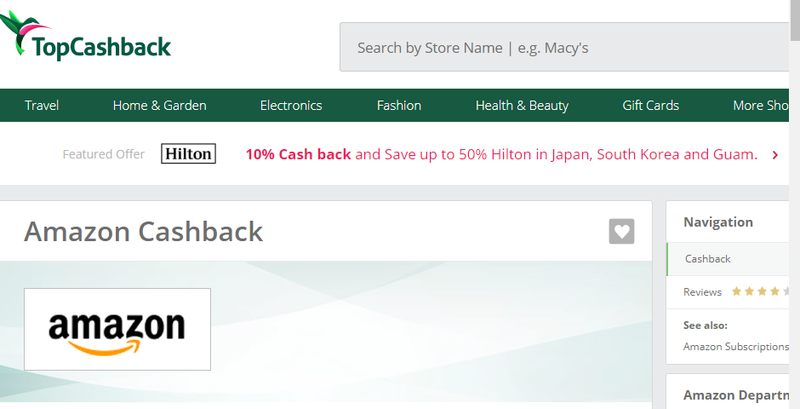 Click onto the Cashback tab for a more in-depth look at the percentage discounts available which usually range from 2% to 100%. 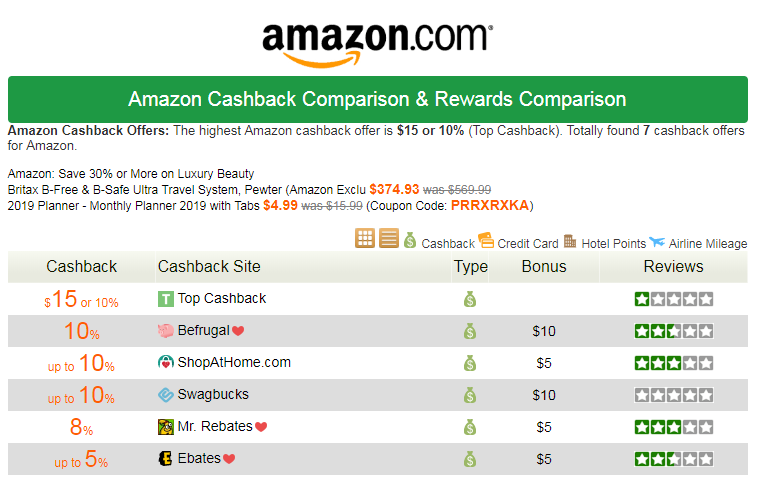 The cashback tab shows the percentage discount offered by each site by store. You can then click onto a particular store to that particular deal. Note, not every deal is available for every territory. The Cashbackmonitor site will take you to a particular offer by a particular cash back site. You will need to be registered with that site in order to claim a discount. On clicking on an offer, you will be prompted to either sign in or sign up to that site. 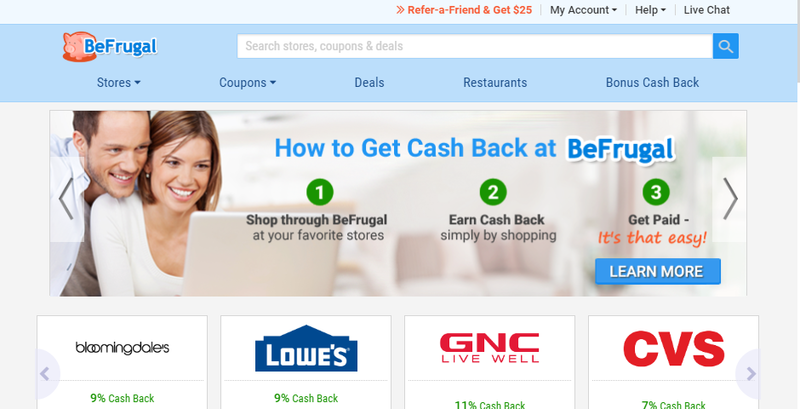 You need to follow the process of that particular cash back site. 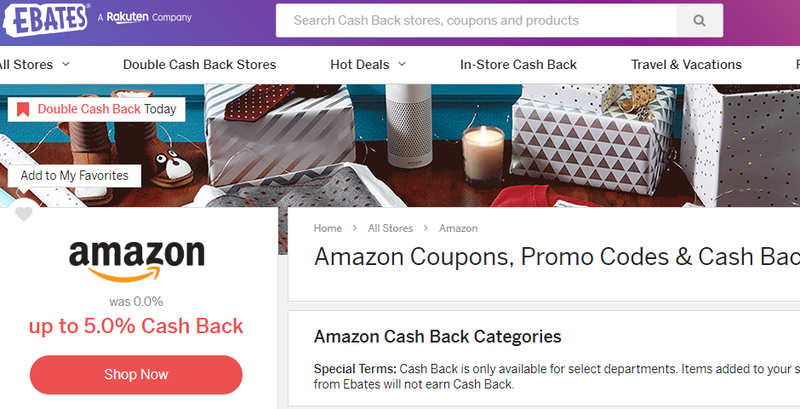 Ebates is an Amazon owned affiliate site which offers discounts (usually up to 10%) on purchases made through Amazon’s affiliate stores online. After signing up to become an Ebates member (which is free and simple), you will then have access to a large number of affiliate stores through the Ebates website. Search for your chosen store, click onto the ‘shop now’ button and then shop the site as you normally would. 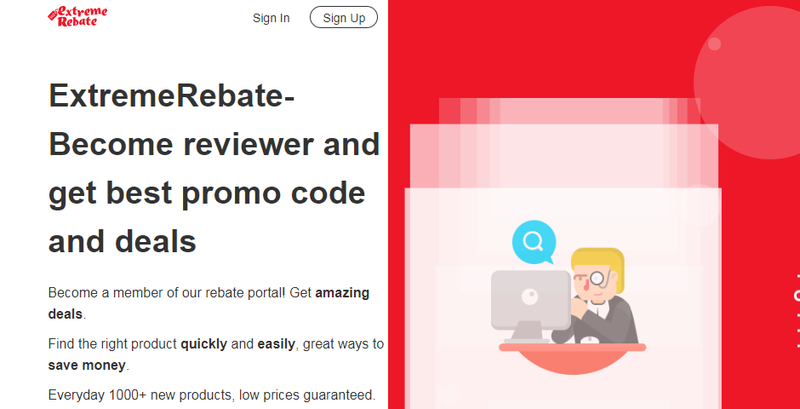 Provided that you have navigated to your chosen store via the Ebates site, after you have made a purchase, the percentage discount will then be credited to your Ebates account. You can then cash out your Ebates balance quarterly, either by check or by Paypal. Note, Ebates is not available to customers in EU countries. 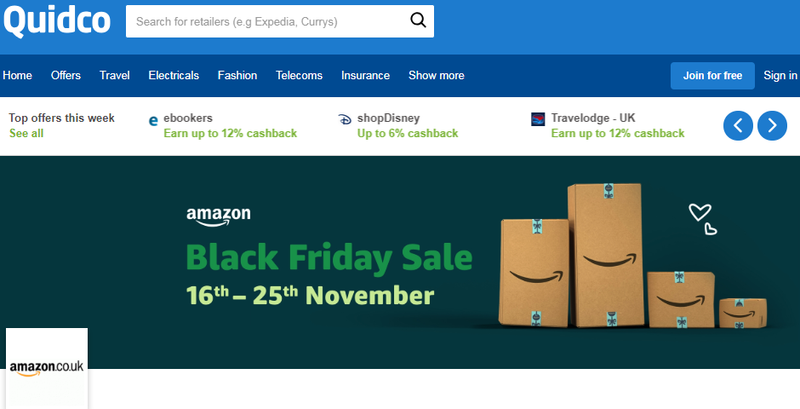 Popular cash back site, Quidco, offers up to 100% discount on products and services from a number of big brand online stores and services including ebookers, Amazon, H&M and, electronics giant, Currys. The easy to use Quidco site offers at-a-glance discounts and cash back deals which are accessed by just the click of a button. As with most cash back sites, you need to become a member in order to enjoy the benefits of Quidco but, don’t worry, membership is free and takes just a couple of minutes. After signing up and making your purchase via the Quidco site, you’ll receive an email showing the amount of cash back that you are owed. Once the retailer or service provider has confirmed your purchase, your refund will appear in your Quidco account. You can cash out from Quidco weekly and can choose to have payments made by Paypal, straight into your bank account or by Amazon gift card. 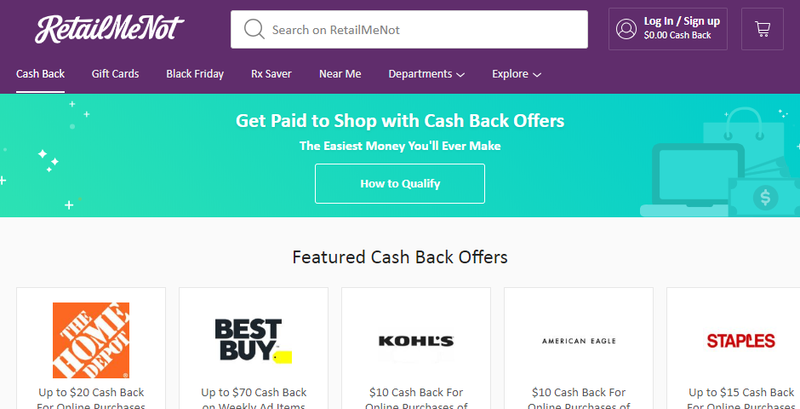 Cashbackholic is a popular cash back site which features some of the more popular cash back and rebate sites as well as a Daily Hot Cashback Store list which highlights discounts offered by a huge number of stores, including leading brands such as Macys, Walmart and Levis. After becoming a member of Cashbackaholic, you can enjoy big store discounts from 2% up to around 40%. You can browse through stores on the home page or search by name to find your favorite. Click onto a store to find out which sites are offering the best discounts. Click onto a site and you’ll be directed to either sign in or sign up (you’ll need to be a member in order to benefit from discounts offered by that site. Each site has a different process which you’ll need to follow in order to receive your discount or refund. Retailmenot is crammed full of discount offers from leading brands such as Kohls, Sephora and Stales. Sign up for free to the Retailmenot site to get access to hundreds of great discounts from your favorite stores. Simply tap onto an offer and then, once directed to that store, you can browse and shop as you normally would. Provided that you have met the minimum amount spend before fees, taxes and shipping, the amount of your discount will be credited to your Retailmenot account which you can then swap for gift vouchers or have transferred to your bank account or Paypal. Extreme Rebate is a website which rewards reviewers with free or discounted products. The website is chock full of great products, all organized into easy to find categories such as fashion and jewellery and home and kitchen. Products are offered at a range of discounts from 50% to 100% which are clearly marked for each item. Signing up is free but members must have an Amazon profile and will need to enter the URL onto the Extreme Rebate site before shopping. Once you’ve chosen a product, click onto it to view the deal. You can then either save the product to your wishlist or choose ‘Request Now’. Once requested, you’ll receive a message to let you know that your request has been forwarded to the seller. The seller should contact you within 48 hours to let you know if you have been selected for the deal. If accepted, there are two ways for you to get your cashback – the first is the Rebate Model whereby you purchase the product and then submit your order to Extreme Rebate for a refund. 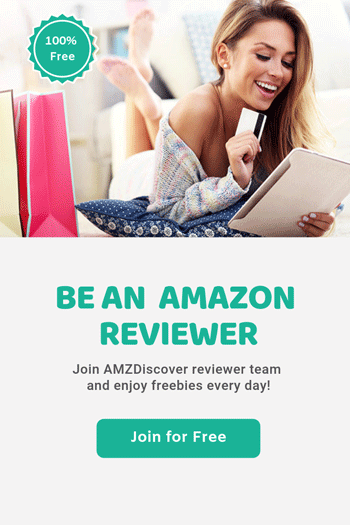 The second method is by Amazon Voucher whereby you will receive an Amazon discount code to be used when you make your purchase on the Amazon site. Extreme Rebate has a great selection of products on offer – just be aware that you may be disappointed if you are not accepted to receive a deal. With so many great cash back sites available, you’ll wonder why you ever shopped without them – just make sure that you read the terms and conditions carefully before making a purchase.